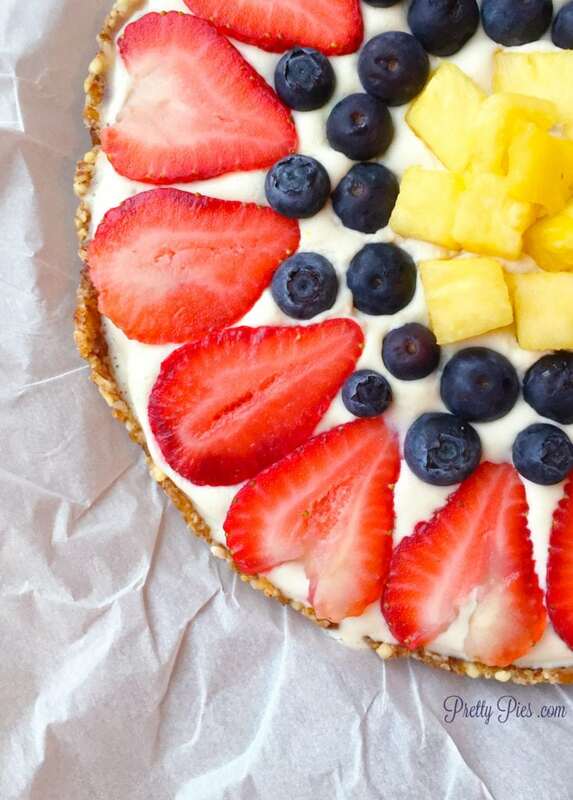 This is Emily from PrettyPies.com and I am delighted to be guest posting for My Whole Food Life today to share this recipe for No-Bake Fruit Pizza! 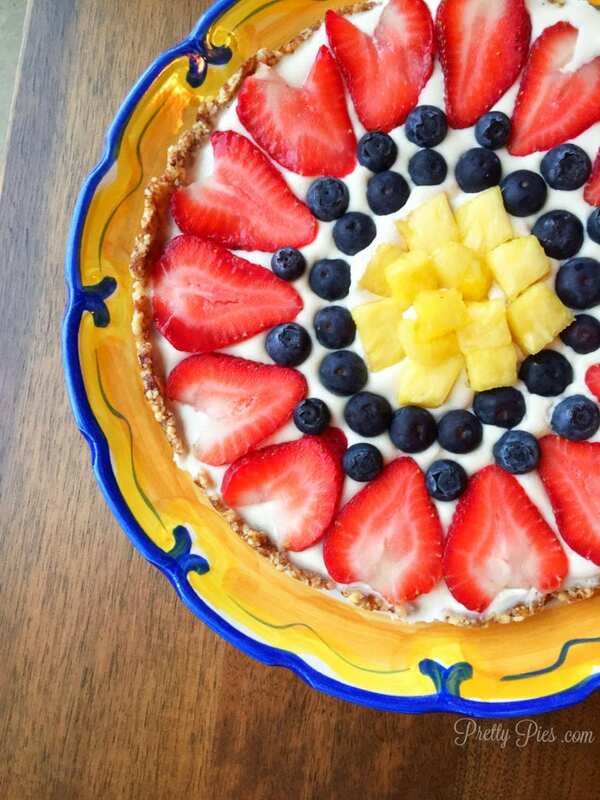 This fun summertime dessert is perfect for the 4th of July! Many years ago, long before my whole-foods transformation, I was introduced to a dessert known as fruit pizza. Have you tried it? Basically, it’s a concoction of ultra-processed foods: store-bought refrigerated cookie dough, cool whip, marshmallow fluff or cream cheese plus more refined sugar. A long list of not-so- healthy ingredients. Since I’d much rather have real food, I decided to do a recipe makeover! This fruit pizza is made with just a few whole foods— nuts, dates, coconut, maple syrup, and fruit. REAL food you can feel good about eating. A wholesome treat that actually nourishes your body? A nutrient-dense dessert– full of fiber, and vitamins and minerals like potassium and magnesium?! Check and check! MUCH healthier than a conventional fruit pizza. And hello, healthy frosting! This frosting is bright, fresh and delightfully lemony! It’s made from coconut! Did you know it’s SO easy to turn shredded coconut into delicious coconut butter just by putting it in a food processor? (I heart my Cuisinart!) Add some coconut cream, lemon and a little sweetener and you have an amazing, thick creamy frosting. I want to slather this frosting on everything– muffins, toast, or just eat it with a spoon! Decorating your fruit pizza is so much fun! Get creative with patterns and make a beautiful design. And you can choose whatever kind of fruit you like. Lemon is so complementary to ALL berries. I especially love strawberry and blueberry paired with lemon. Delish! hit at your next gathering. 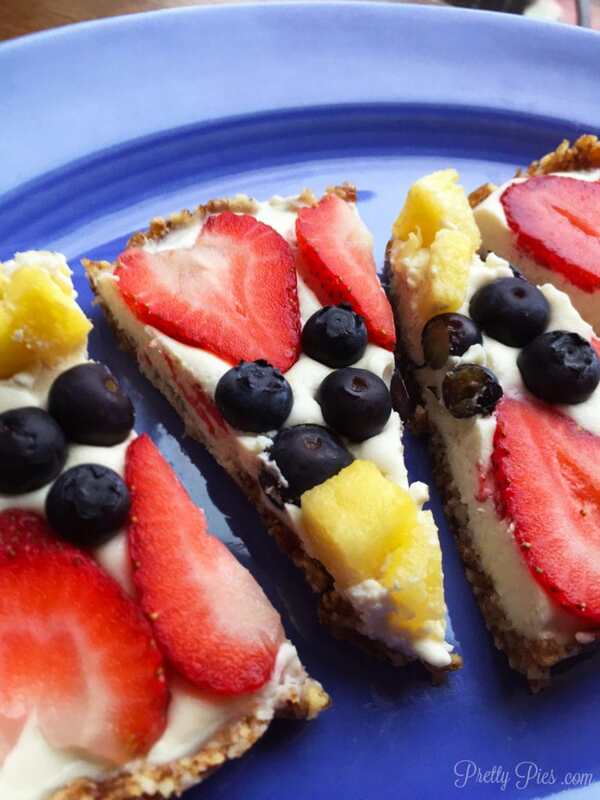 Fruit Pizza is the perfect festive dessert to bring to a summer cookout or party! Pour over crust (see notes) and set in the fridge uncovered for 20 minutes to lightly set the filling. Garnish with fruit of choice and return to the fridge for a couple of hours to firm up. When set, grab the parchment to lift pizza out of the pan. Use a pizza cutter to slice. Enjoy! Depending on the size of your pan, and how thick you like your frosting, you may not use it all. If you like a thin layer of frosting, use half and save the rest for another pizza (or for another use.) Leftover frosting will firm up in the fridge, so gently warm it up (a few seconds in the microwave works) and it will return to a spreadable state. Store pizza tightly covered in the fridge. Should last 4-5 days, depending on the fruit you use. I recommend berries-- any kind! Kiwi, sliced grapes, diced mango, and pineapple are great, too! Avoid fruits that brown quickly, like pears, bananas and apples. Emily Spain is a mom, wife, and blogger at Pretty Pies where she shares recipes for beautiful, delicious and wholesome desserts made only from whole foods. She is a real-food enthusiast that is passionate about helping people discover the beauty of un-processed food by creating their own delectable treats. You can follow her on Facebook, Instagram and Pinterest. You could also use a springform pan, which may make it a little easier to extract. This looks great! What is coconut cream and were do you get it? I purchased mine in a can at the store. Worked fone. I made this last night. I'd love to replace the fruit Pizza with cool whip that a teacher is making at school but this one has almonds. Any ideas on replacing the almonds? It's a nut free school. Thanks! Yes my frosting turned out very curdled...not even sure if I want to use it...,not sure how to fix it?